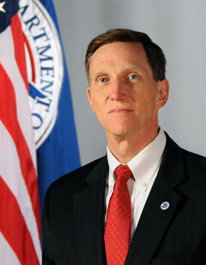 John Pistole, head of the TSA, will retire after leading the agency for more than four years, Reuters reports. Pistole was in charge of 60,000 employees and security operations at more than 415 airports nationwide. Pistole “has been integral in leading TSA’s transformation to a risk-based, intelligence-driven counterterrorism agency dedicated to protecting our transportation systems,” Homeland Security Secretary Jeh Johnson said in a statement. “Because of his efforts over the past four and a half years, our country’s transportation systems are more safe and secure,” Johnson added. Johnson did not say what prompted the retirement. Posted: 10/17/14 at 9:06 AM under Milestone, News Story.